There are at least 9 “species” of blackberry in Tasmania. These closely related group of brambles vary considerably in size, vigour, leaf shape, ability to spread and susceptibility to control measures. 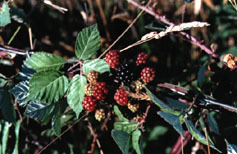 Growth Habit: Blackberry canes are long and thorny and grow in thickets. Canes can grow up to 6 metres in length and thickets can extend to hundreds of square metres in area. Canes die off after 2 to 3 years but are usually retained in the thickets making them largely impenetrable. Type of plant: Plants are perennial plants and may be deciduous depending on local conditions. Fruit/Seed: Purple-black berries in late summer to autumn. Dispersal: Seed are spread by animals and birds eating the fruit and passing the seed some distance away from the thicket. Seed is transported by water along creeks and rivers. Canes may put down roots where their tips touch the ground producing new plants. New shoots can grow from root fragments. Distribution: Blackberries are widely distributed throughout all the settled areas of Tasmania. They do best in higher rainfall areas, in wet gullies and along creek and stream sides. Status: Blackberries are declared Secondary Weeds in Tasmania. These plants are Declared Noxious Weeds in most areas on the mainland. Blackberry rarely invades intact bushland, well managed pasture or established tree plantations. However, in disturbed sites such as cleared roadsides, creeks, forestry coups and fence lines blackberry will quickly become the dominant plant. Blackberries are highly competitive plants producing such a dense canopy that the lack of light severely limits the growth of other plants. Because plants are so prickly grazing animals, particularly sheep and cattle, avoid grazing near them effectively decreasing the usable pasture area. Young sheep and goats that get tangled up in the canes die of thirst and hunger. The berries provide an important source of food to introduced pest birds such as starlings and blackbirds. The impenetrable nature of blackberry thickets reduces peoples access for maintenance of fence lines and for forestry practices as well as recreational pursuits. It also reduces stocks access to water and provides safe refuge for rabbits and other vermin. Dense thickets around farm buildings and fence lines are a considerable fire threat. They provide a valuable, cheap source of vitamin C rich fruit. The quality and timing of pollen availability and nectar flow are important in the Tasmanian honey industry. In degraded urban areas, blackberry may provide valuable nesting sites for native birds and animals, keeping them safe from predators such as neighbourhood cats and dogs. Blackberry leaves may have medicinal properties for humans and stock animals. Similar Plants: The native raspberry, Rubus parvifolius is a smaller and more delicate plant. It is much less thorny and does not form the large thickets typical of the blackberry. For further information on blackberry contact the Department of Primary Industry, Water and Environment, Tasmania (Service Sheet 67/95, Agdex 647). Slashing and burning (all year). This is only a temporary measure, but useful in providing access for other control measures. ﻿Grazing (all year). Goats readily eat blackberries and are capable of destroying large infestations. Sheep are useful to some extent as they eat seedlings and young top growth. Pigs will dig out the roots. Cattle exert little or no grazing pressure on blackberries and are relatively ineffective in controlling them. Bio-control (between Nov – Jan). The rust Phragmidium violaceum is prevalent throughout Tasmania. The susceptibility of blackberries to the rust varies markedly with species, habitat and seasonal conditions. In most cases, the rust will not provide adequate control. A more virulent strain of the rust is being trialled in mainland States. Grubbing (all year). Physical removal of the crowns and much of the root system by grubbing, cultivation or bulldozing is effective. This needs to be repeated to destroy any regrowth of the blackberry from root fragments. Control of seedlings and regrowth of root fragments will need to be done for 1-2 seasons following primary treatment. Spraying (between Sep – Jan). There are five herbicides registered for use on blackberries in Tasmania: Triclypor, amitrole, glyphosate, hexazinone and metsulfuron.